With his long-awaited discharge from the U.S. Army at Ft. Bayard in 1875, Sergeant James C. Cooney was at last free to pursue the exploration and development of a mineral vein he had discovered and claimed five years earlier while on patrol up what is now known as Mineral Creek in Catron County, about eight miles northeast of the present community of Glenwood, New Mexico. Within a short time, the claim proved to have valuable tonnage of copper, silver and gold ore. As news of the success of Cooney Mine’s spread, the small mining enclave of Cooney Camp swelled to a population of some 300 to 400 souls as mine workers and prospectors descended on the area. Encouraged by the results of his mine, Sgt. Cooney organized a group of interested partners to prospect the surrounding mountains. The subsequent history of Cooney Camp, and how the veins of that area were traced a couple of miles southward into what was to become the famous Mogollon Mining District, is one of the most fascinating chapters of New Mexico’s early mining history. One of Sgt. Cooney’s partners was a man by the name of John Lambert1, of whom little is known other than the fact that he apparently was quite successful in locating rich veins of gold and silver in the mountains about a mile east of the soon-to-be boom town of Mogollon. By the 1890s, Mogollon was bursting at the seams with some 3,000 to 6,000 miners and associated supporting humanity, and the rich veins that Lambert found had been developed into the Confidence, Bluebird, Blackbird, and Redbird mines. Of these, the Confidence Mine proved to be especially rich Over the years it was mined to a depth of some 1,030 feet, with production reported to have yielded about $1,200,000, a princely sum in those early days in frontier New Mexico2. John T. Graham was the Superintendent of the Confidence Mine during its early years and quickly saw that the economics of the mine would be greatly enhanced if a processing mill could be developed nearby. He knew that short transportation distances and an ample supply of year-round water would be the critical factors in establishing such a mill. 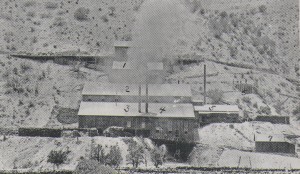 Since the mines surrounding the Confidence Mine were all within a mile or less of the only route connecting Mogollon with the San Francisco River valley to the west (now called the Bursum Road or State Road 159), Supt. Graham hit upon the idea of building a mill on the northwest slope of Whitewater Creek Canyon, about two miles south of the mines, and just downstream from where Whitewater Creek exits the extremely narrow and steep-walled canyon now known as the Catwalk Recreation Area. This site was ideal, he reasoned, since it was only three or four downhill miles from the mines via the Bursum Road route to the south edge of Whitewater Mesa, where the ore could then be easily delivered to the mill a few hundred feet below through an ore chute. The critical factor of water supply could be satisfied by building a pipe line up the narrow slot canyon of Whitewater Creek. With the help and partnership of ex-Colorado Governor David Moffat, the envisioned mill was completed in 1893, with an initial water supply provided by a four-inch pipeline which was laid up Whitewater Canyon. In honor of its founder, the new mill was named the Graham Mill, and the small town of some 200 people that grew up around the mill was also named Graham, although some preferred the alternate name of Whitewater. The exact site of the town is now the parking area for the Catwalk Recreation Area. Within a short time the water demands of the mill and the town exceeded what the 4-inch line could provide, and a new 18-inch pipeline was built up the canyon on a wood and steel framework sometimes elevated as much as 20 feet above the creek. In the narrowest part of the canyon, square holes were chiseled in the sheer volcanic rock walls to hold the timbers and wooden walkway supporting the heavy pipe. All in all, the pipeline and supporting framework was an incredible engineering feat. Mill records reveal that because of frequently-occurring floods, this large iron pipeline required constant maintenance. Workmen assigned to keep the pipeline functioning were required to hike up and down the pipeline on a wooden planked platform running beside the pipeline, which they quickly came to call “the catwalk”. The Graham Mill was a substantial structure, and essentially state of the art for the times. The mill was powered by a Pelton water wheel capable of producing 350 HP, backed up by a wood-fired, 300 HP Corliss steam engine during periods of low water, and boasted a purported processing capability of up to 75 tons of ore a day. However, despite several upgrades, the mill never achieved its full potential and eventually ceased operations permanently in 19133. In time, as was the case with so many of these short-lived mining towns in the Southwest, all of the buildings and machinery were dismantled, sold, and moved away. 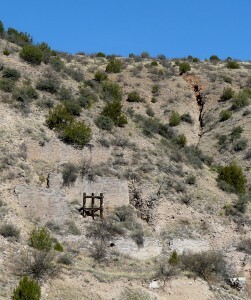 Today, the only remains of the mill and town of Graham are a few decaying timbers and rock-terraced foundations of the mill which can be seen on the side of the canyon on the southwest side of the Catwalk parking area. 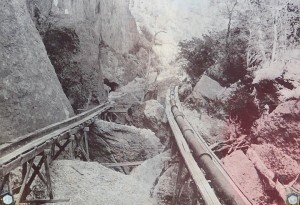 From 1913 until 1934 the deep rocky chasm of Whitewater Canyon and the Catwalk was largely forgotten and silent except for the sounds of rushing water and wind. 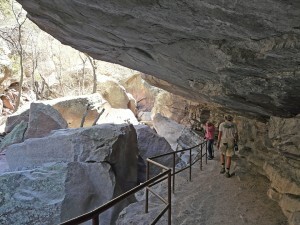 Then, in 1935, the Civilian Conservation Corps, or CCC Boys as they were called in those days, were given the task of rebuilding the Catwalk and the lower portion of Whitewater Canyon as a recreation area as part of the Gila National Forest. The project took two years and served until 1961, when the old wooden Catwalk was replaced by the Forest Service with a new metal catwalk. In 1978, the Catwalk portion of Forest Trail 207, plus an additional 1.15 miles of the trail to the junction of Whitewater Creek and South Fork, were designated a National Recreation Trail. Since then, the Catwalk and the adjoining trail system have been repeatedly upgraded and expanded over time, most recently in 2003, with the $1.5 million installation of a new steel catwalk, plus the construction of a new half-mile wheelchair-friendly trail on the southeast side of the lower portion of the Catwalk. Today, some 325 miles of interlocking trails in the high country of the Mogollon Range can be accessed where Forest Trail 207 and Forest Trail 41, the Gold Dust Trail, split off from the Catwalk Trail at the west end of the suspension bridge near the 1.0 mile marker of the Catwalk. The Catwalk Trail and Recreation Area is a true national treasure for the outdoor enthusiast. No matter what your passion — seeking out the cultural history of the Old West, pursuing photography or painting, quiet contemplation within the inspiring beauty of pristine Nature, seeing and learning about the unique and spectacular volcanic geology of the Gila Wilderness, enjoying a refreshing soak and swim in the crystal clear waters of Whitewater Creek at the end of a High Country Hike on a hot Summer day — there is great joy to be had at the Catwalk regardless of age or physical abilities. Indeed, it is extremely rare to find as much diverse natural beauty and opportunities for outdoor pursuits packed into such a short section of trail as can be experienced on the 1.25 mile long journey along the Catwalk Trail. Regardless of one’s skill level, technique, or interest, the Catwalk offers the nature photographer or artist easy and unique access to endlessly-inspiring subject matter throughout the year. At virtually every step along the trail one encounters an ever-changing drama of light and shadow as brilliant rays of sunlight alternately penetrate, illuminate, refract, reflect, and suddenly extinguish amongst the sheer canyon walls, the twisted trunks and branches of the ancient cottonwood and sycamore, and the churning, tumultuous waters of boulder-strewn Whitewater Creek. For many of us, simply to experience the overpowering natural beauty of the Catwalk is more than enough reward for a day spent in the enchanting world of Whitewater Canyon. However, at some point, some visitors may begin to have questions regarding the underlying causes and processes that have created the unique and special character of the Catwalk Trail that we have come to enjoy. It is in anticipation of those questions that a short discussion of the underlying geology is herein presented; an understanding, which, hopefully, will lead one to an even deeper and richer appreciation of what a truly special place the Catwalk is. The Casitas de Gila Nature Blog of March 2011, The Supervolcanoes of the Gila Wilderness, presented a geologic overview concerning two periods of major and highly explosive volcanic activity that occurred within the Mogollon Range in the western half of the Gila Wilderness when the proposed Mogollon, Bursum, and Gila Cliff Dwelling super-volcanoes erupted some 34 and 28 million years ago. Extensive geologic field research conducted over the past 30 years in the Mogollon Range east of Glenwood, New Mexico (specifically within the Mogollon and Holt Mountain4 quadrangles) reveals a complex history of periodic repeated vulcanism. The sequence of events starts with an initial filling and swelling of a deep seated magma chamber, followed by explosive eruption and then subsequent collapse of the overlying caldera. Not much is known about the size and extent of the actual caldera of the 34-million-year-old Mogollon Supervolcano (proposed in 2006 by James Ratté, a geologist with the United States Geological Survey), since all but a small exposure of its presumed location is covered over by younger thick volcanic deposits from the 28 million year old Bursum and Gila Cliff Dwellings supervolcanoes. But even though the caldera of the Mogollon Supervolcano itself is deeply buried, geologists have been able to discover and document much about the nature and volcanic history of this ancient supervolcano by studying the extensive 2,500- to 3,000-foot-thick sequence of volcanic deposits that were ejected from the caldera and are now beautifully exposed along the Catwalk and Gold Dust trails of Whitewater Creek Canyon, and in Mineral Creek Canyon to the north. The thick layered deposits of volcanic material from the Mogollon Supervolcano now exposed along the Catwalk Trail are collectively called the Cooney Tuff formation, which consists primarily of various types of welded ash fall and ash flow tuffs, or ignimbrites, as they are sometimes called. Welded tuffs are composed of fine to microscopic volcanic mineral matter and rock particles which are explosively ejected into the atmosphere during a volcanic eruption in the form of an incandescent, super-dense gaseous cloud which then settles back to earth still in a near-molten state, where the particles fuse or weld together to form layers of rock. 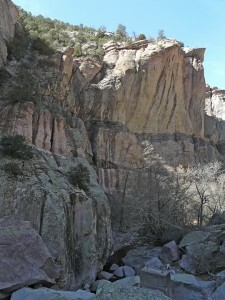 The name Cooney Tuff comes from the extensive exposures of these rocks where they were first described and mapped around the old gold, silver and copper mining district of Cooney Camp, which was discovered in the late 1800s in Mineral Creek Canyon, about four miles north of Whitewater Canyon (see Casitas de Gila Nature Blog on Mineral Creek). Today, as a result of extensive study and mapping done by Ratté and others, the rocks of the Cooney Tuff formation have been divided into three distinctly different rock type units, or Members as they are called in geological terminology, which can be traced throughout the area. From oldest to youngest, these are: 1) the South Fork Member of the Cooney Tuff; 2) the Whitewater Creek Member of the Cooney Tuff; and 3) the Cooney Canyon Member of the Cooney Tuff. Together these three members of the Cooney Tuff formation comprise all of the colorful rocks that make up the canyon walls observed along the Catwalk and Gold Dust trails. The following brief geologic trail guide is based on the geology observed along the original Catwalk Trail which begins on the west side of Whitewater Creek immediately after leaving the parking area; the Gold Dust Trail (Forest Trail 41) which leaves the Catwalk Trail at the 1.0 mile marker; and an alternate return route from a trip up the Catwalk Trail that takes one over the new wheelchair-friendly trail on the southeast side of Whitewater Canyon. Descriptions for the Catwalk portion of the guide are keyed to the 6-inch diameter iron pipe trail markers which the Forest Service has placed at ¼ mile intervals along the trail. 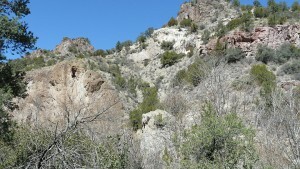 Just past the picnic area, the first rock outcrops encountered are light grey to reddish tan welded tuffs belonging to the Cooney Canyon Member of the Cooney Tuff. Here the rocks are highly fractured, brecciated, and in some places pulverized due to the presence of a major north-south trending fault system which separates the San Francisco River Valley on the west, behind you, from the uplifted front of the Mogollon Mountain Range to the east, which you are now entering. Cooney Canyon Member rocks range in composition from rhyolite to dacite. If you look closely at these rocks, you will see larger chunks of angular rock fragments that are imbedded in the matrix of the finer, welded ash tuffs which were blasted from the volcano in an explosive eruption before falling back to earth. If you look very closely, you will also find numerous joints or fractures in the rock where the rock surfaces on either side of the fracture appear to be polished and may exhibit parallel striations or grooves on the polished surfaces. 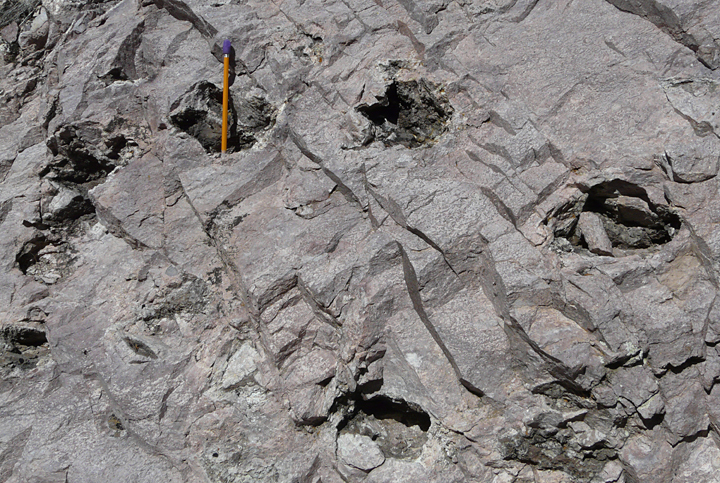 These features are called slickensides and are evidence of frictional movement or micro-faulting along these breaks in the rock. Continuing on up the trail, a little beyond the ¼ mile marker, you come to a sheer cliff rising before you which is composed of a very different looking rock than the exposures of the Cooney Canyon Member that you have been passing through. This cliff face, along with the abrupt change in rock type, marks the presence of another major northwest trending, almost vertical fault, named the Catwalk Fault. Here the rocks composing the cliff on the east side of the fault in front of you belong to the Whitewater Creek Member of the Cooney Tuff, and have been moved up relative to the rocks of the Cooney Member on the west side of the fault, which have been moved down. Crossing the fault and examining the rocks of the Whitewater Canyon Member, you will immediately notice that this rock is characterized by the presence of abundant, irregularly shaped globular cavities in a massive, strongly fine-grained salmon or pinkish-red color welded tuff. 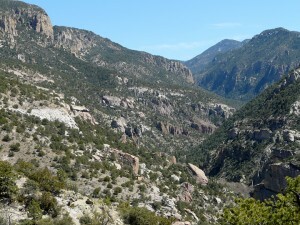 The rocks which comprise the Whitewater Canyon Member are rhyolite in composition, which, by definition means that the rock is very rich in silica. 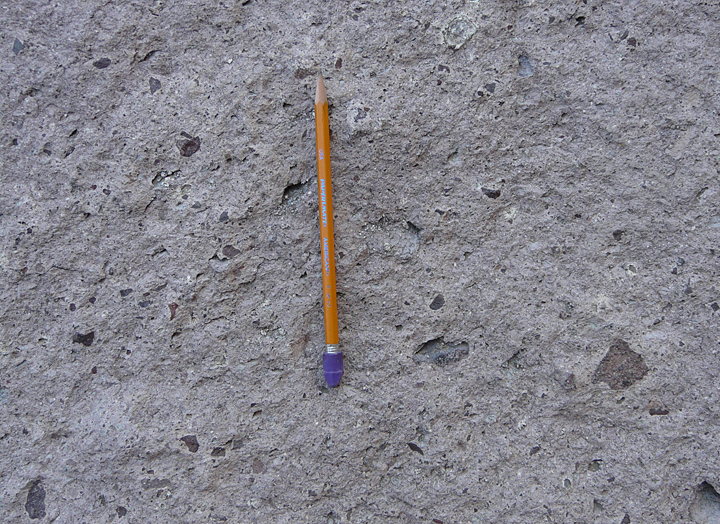 Verification of this classification can be readily ascertained by looking closely at the rock where small phenocrysts of quartz will be seen imbedded in the finer matrix material. Also, if you look closely at the globular cavities, you will see that many of them are lined with very small quartz crystals. These unusual features are called lithophysae, which literally translated from the Latin means “stone bubbles”, which gives a good clue to their origin. 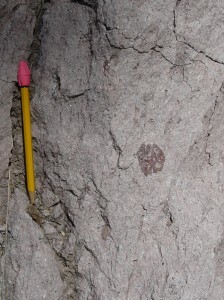 Lithophysae are formed by bubbles of gas expanding within incandescent ash fall and ash flow tuff deposits as they accumulate, compact and solidify. 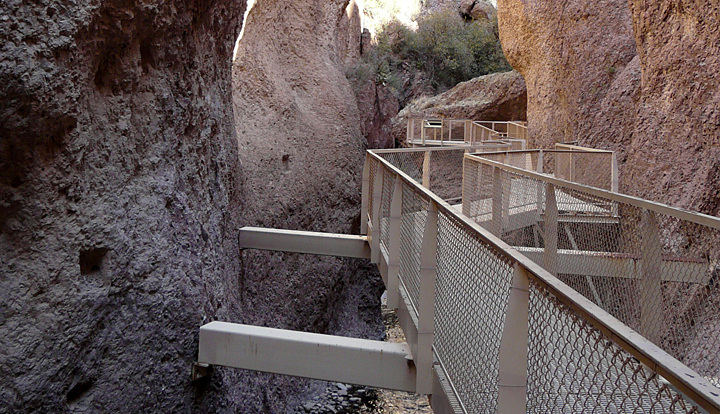 The Whitewater Canyon Member comprises the full length of the narrow, slot canyon portion of the Catwalk Trail providing today’s visitor to the canyon with unlimited opportunity for close-up examination of this unusual rock type from the new steel walkway secured to the vertical canyon walls some 20 feet above the creek. At numerous places along the walkway one can also observe the square holes that workmen from the Graham Mill chisled into the canyon walls a hundred years ago to secure the massive timbers required to support the heavy iron water pipe coming down from the upper reaches of White Water creek. Soon after passing the ½ mile trail marker and just after crossing the wooden bridge, the narrow slot canyon is abruptly left behind as the trail begins a steady climb up a much wider canyon composed once again of welded tuffs belonging to the Cooney Canyon Member. What has happened here is that another major fault has been crossed, which, with a little observation, can be seen exposed on both sides of the canyon. If one pauses for a moment at this point and reflects on the sequence of rock units that one has passed through in the first half-mile journey up the Catwalk trail, there is an interesting chapter in the geologic history and evolution of the Catwalk Trail that is waiting to be revealed here. 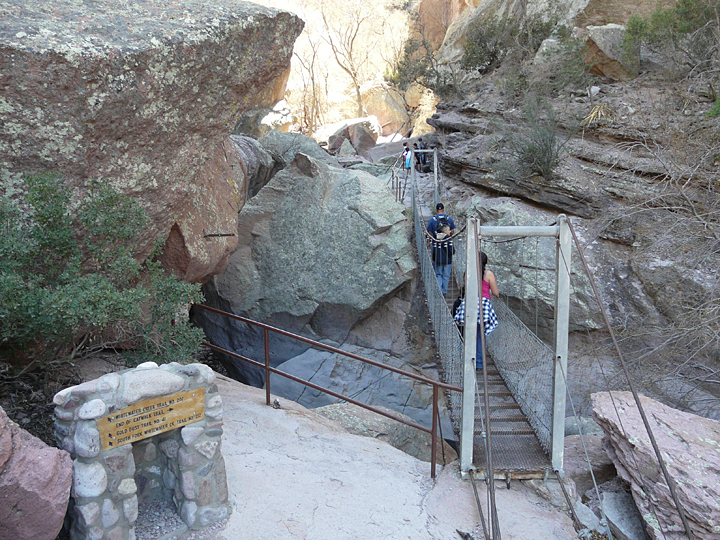 At the beginning of the Catwalk Trail, the rocks were identified as belonging to the Cooney Canyon Member, the youngest and upper-most member of the Cooney Tuff formation. Then, just before the canyon abruptly narrows to a sheer-walled slot canyon, the Catwalk Fault was crossed and immediately the composition of the canyon walls changed into the massive, dense and lithophysae-bearing rhyolite welded tuff of the Whitewater Member, which as the middle member of the three identified members of Cooney Tuff formation, makes it older, and hence deposited before, the rocks of the Cooney Canyon Member. Finally, just beyond the half-mile trail marker, another major fault was crossed just as the canyon abruptly widened significantly and once more the rocks were identified as belonging to the Cooney Canyon Member. Vertical fault on east side of the Whitewater Creek Member Horst Block. Reddish-tan rhyolite welded tuff of Whitewater Creek Member on left side of fault; white welded tuff of Cooney Canyon Member on right side of fault. Pondering the origin of this sequence of rock relationships, one eventually comes to realize that the only possible explanation for this sequence is that the massive block of the older White Water Creek Member of the Cooney Tuff formation, which is bounded on each side first by faults and then by rocks of the younger Cooney Canyon Member, has to have been moved up or uplifted, relative to the younger Cooney Canyon rocks, which have been moved or dropped down on each side of the White Water Creek Member block. In geological terms, this type of structural feature is called a horst. The significance of this structural feature to our discussion of the Catwalk geology is that an understanding of the sequence of events leading up to and after the uplift of the horst block of the Whitewater Creek Member is key to understanding how the sheer-walled slot canyon portion of the Catwalk came to be formed. 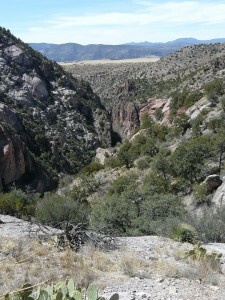 The following interpretation for the origin of the slot canyon offers one possibility. Originally, during the period of time when the Mogollon Supervolcano was active, and long before faulting uplifted the horst block of the Whitewater Creek Member, the area where the Catwalk Trail is now located was covered with thick, widespread deposits of what we now call the Whitewater Creek Member rhyolite welded tuffs. 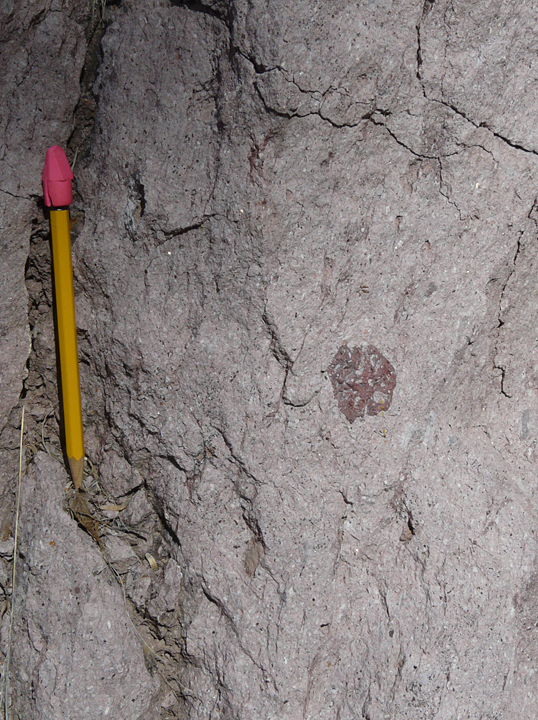 As repeated eruptions of the Mogollon Supervolcano continued, these rhyolite tuffs were, in turn, covered over with subsequent deposits of Cooney Canyon Member welded tuffs. With the end of the Mogollon Supervolcano eruptions, around 35 million years ago, this part of the Gila Wilderness remained relatively quiet for some 5-6 million years. After this period of quiescence, volcanic activity once more resumed in the area with an extended period of repeated explosive eruptions of the Bursum Supervolcano, centered a short distance to the east, which deposited thick layers of volcanic material on top of the Cooney Canyon Member welded tuffs. Following the end of the Bursum Supervolcano eruptions, about 28 million years ago, the area was quiet once more and an extended period of erosion commenced over the area. It was during this time that an ancestral Whitewater Creek began to cut down through the thick layers of volcanic tuffs where the Catwalk is today. Eventually, after several more millions of years of erosion, the ancestral Whitewater Creek had succeeded in cutting a deep canyon through the Bursum Supevolcano deposits and down into the underlying Cooney Canyon Member deposits. It was at this point, perhaps around 17 million years ago, that a period of extensive faulting occurred, which was probably related to the collapse of the Bursum Caldera. With this faulting came the uplifting of the Whitewater Creek Member horst block. And, as this block was moved upwards, the ancestral Whitewater Creek, which by now was confined to a deep canyon cut in the Cooney Canyon Member deposits, accelerated its downcutting through Cooney Canyon deposits and began cutting into the underlying and uplifted Whitewater Creek Member horst block. Because of the greater density and hardness of the Whitewater Creek rhyolite welded tuff deposits, the ancestral Whitewater Creek soon became captive or entrenched in a narrow, sluice-like channel cut into the rock from which it could not escape. The physical process controlling this type of stream erosion is that when the hydraulic energy of a stream is confined to a narrow channel in resistant rock, the result is intensified downward cutting action, as opposed to what happens to a stream cutting into softer materials, where the hydraulic energy of the moving water is dispersed over a broader area as the banks bordering the stream are eroded away through greater lateral cutting action. Thus it was, after millions of years of such continued entrenched downcutting, that the Whitewater Creek Narrows of the Catwalk Trail eventually evolved into the spectacular chasm that one sees today. After crossing the wooden bridge just past the 1/2 mile marker, the Narrows are left behind and the canyon, widens offering impressive views from the trail. From here to the end of the Catwalk Trail at the 1-1/4 mile marker the rocks observed along both sides of the trail and the colorful towering canyon walls above belong to the Cooney Canyon Member. As was described at the beginning of the Catwalk Trail ,this upper member of the Cooney Tuff formation consists primarily of thick sequences of fine-grained, light grey to reddish tan welded ash-fall and ash-flow welded tuffs of rhyolite to dacite composition. 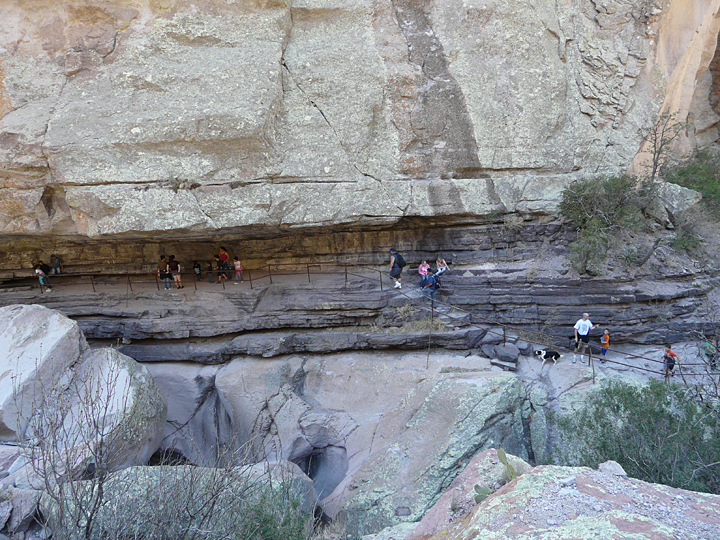 At various places along this section of the trail, however, the observant traveller will come across or notice in the canyon walls overhead a number of thin interbedded layers of a dark brown to almost black, fine- to coarsely-grained rock, which are strikingly different in appearance and texture from the dominant fine-grained light-colored welded tuffs of the Cooney Canyon Member. These dark-colored rocks, which have been variously described by Ratté and others as volcaniclastic sandstones or sandstone breccias, remain somewhat of an enigma as to their origin. 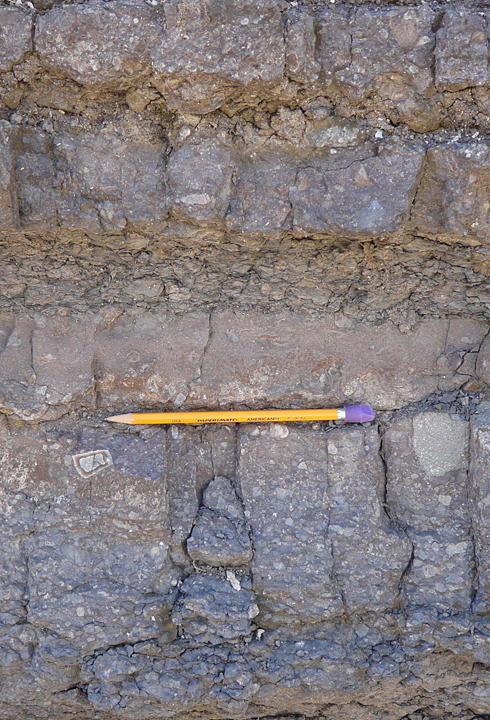 In some places, these thin beds display fluvial cross-bedding and graded bedding on the outcrop, which would suggest deposition by running water. However, when examined in thin-section under the microscope, some samples are found to contain delicate shards and bubbles of volcanic glass, which would be more indicative of volcanic fallout from the atmosphere. It is clear that more research is required before the true origin of this unusual rock is understood. Just before reaching the 3/4 mile marker, a good example of the cross-bedding in the volcaniclastic sandstone can be found, with only a little searching, on a rock outcrop right at the side of the trail, immediately opposite where a steep metal stairway departs from the main trail to descend to a scenic waterfall and swimming hole below in Whitewater Creek. Further along, near the 1 mile marker, several more of these dark interbedded volcaniclastic sandstone beds can be observed high up on the north facing canyon walls. 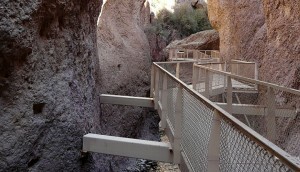 Then, soon after crossing a short suspension bridge, the Catwalk Trail ends at the 1.1 mile marker in a recessed rock alcove in the canyon wall. Here, acting over thousands of years, the rushing waters of Whitewater Creek have cut deeply into one of the volcaniclastic sandstone layers, affording ample opportunity for close-up study of this unusual and enigmatic rock type. The Catwalk Trail offers an unequaled and probably the most accessible opportunity for a close-up examination of a thick sequence of some of the dominant volcanic rock types that are found throughout the western half of the Gila Wilderness. For those visitors who would like to put this understanding into a somewhat broader perspective by looking at the various rock units from a greater distance, such an opportunity is close at hand. 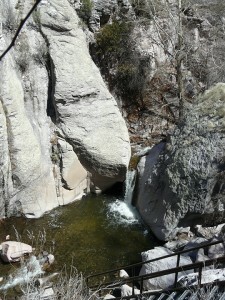 To gain this perspective it is only necessary to retrace one’s steps back from the alcove to the 1 mile marker at the beginning of the suspension bridge where Forest Trail 41, the Gold Dust Trail, begins an easy 1-1/4 mile climb out of Whitewater Canyon to Whitewater Mesa some 500 feet above. The Gold Dust Trail offers incredible views to the east up Whitewater Canyon to the High Country of the northern Mogollon Range, and down the Canyon to the west past the Catwalk parking area to the San Franciso River Valley and the Blue Range Wilderness beyond. All but the western-most end of the Gold Dust Trail passes up through and over layers of the Cooney Canyon Member of the Cooney Tuff, providing close up examination of the rocks within the upper deposits of the member which could not be observed from the Catwalk Trail. Between 1/2 and 1 mile up the Gold Dust Trail excellent views of the entire southeast side of the Catwalk Canyon are possible that clearly show numerous faults and other structural relationships between the three members of the Cooney Tuff formation. 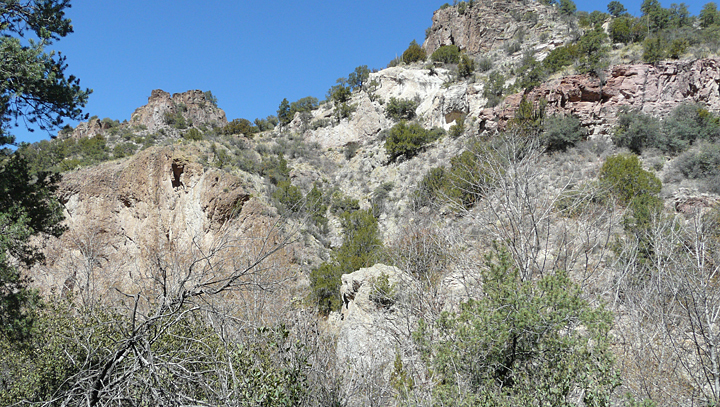 To complete one’s geological investigation of the Cooney Tuff at the Catwalk, an alternative route for one’s return trip down the Catwalk Trail is to take the new trail along the southeast side of the canyon where excellent exposures of the South Fork Member, the lowest member of the Cooney Tuff formation, are exposed. Leaving the old trail at the western end of the suspended metal catwalk in the Narrows, the new trail crosses Whitewater Creek and almost immediately enters a highly brecciated fault zone. 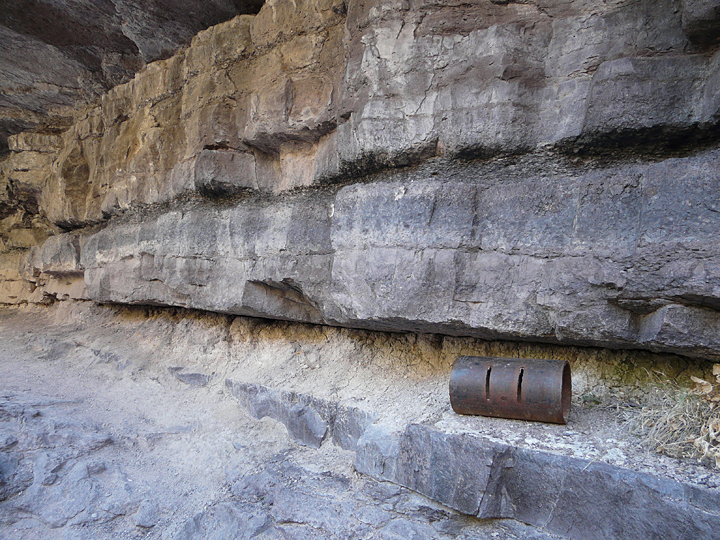 Because of the extreme shattering and overall weakness of the rock encountered within this fault zone during the construction of the new trail, it was necessary to drill and install numerous rock bolts to secure the unstable cliff face. Once past the rock-bolted area, exposures of two different rock types typical of the South Fork Member are well exposed on the cliff face next to the trail. 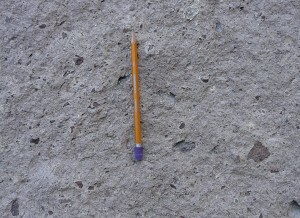 These consist of a thin, dark-colored mafic lava flow, which is overlain by a thicker layer of light-colored welded tuff. 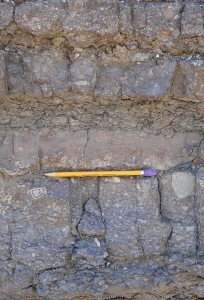 In contrast to the other two members of the Cooney Tuff formation, the South Fork member contains several, dark-colored, mafic or basaltic (iron and magnesium rich, and silica poor) lava flows and related mafic pyroclastic rock units, which are interbedded with light colored, felsic welded tuffs similar to the rock types seen in the Cooney Canyon Member along the Catwalk Trail. These mafic lava flows are unique within the Cooney Tuff formation and represent the only evidence reported to date of molten lava flows emanating from the Mogollon Caldera. Continuing past these last rock outcrops, the trail soon enters an extensive zone of Quaternary landslide deposits before reaching the Picnic Area and the end of the geologic guide to the Catwalk and Gold Dust Trails. 2000, The Catwalk of Whitewater Canyon U.S.F.S. Brochure available (.pdf file). 1927, Henry G. Ferguson, Geology and Ore Deposits of the Mogollon Mining District, New Mexico, U.S. Geological Survey Bulletin 787 (.pdf file). 2008, James C. Ratté, Geology Along the Catwalk National Recreation Trail Near Glenwood, New Mexico, in Geology of the Gila Wilderness-Silver City Area, New Mexico Geological Society Guidebook, 59th Field Conference, p. 16-26. This entry was posted in Catwalk Nature Trail, hiking and tagged Catwalk, forest trails, geology, hiking, volcanoes. Bookmark the permalink.